I am always grateful for when my clients share a new location with me that is special to them when we are planning for their engagement photos. I have always been vocal about encouraging my clients to pick a location that is right for them above all else. 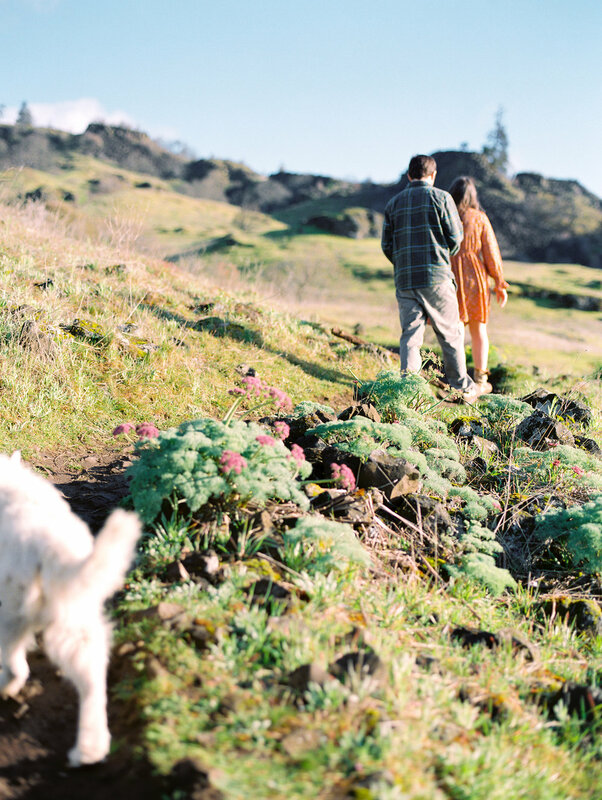 And there is nothing more "right" than a sunrise stroll on a trail you and your pup frequent. I'm not as familiar with Washington's view of the gorge as I am with Portland's, but Jaimie encouraged us to view the sunrise with her, Joe, and Kiara as she promised it was a view worth witnessing. Although an unexpected rainstorm kept us from seeing it right on the dot, the sun that moved behind the clouds minutes after was exactly what we were hoping for. Joe and Jaimie met at the bike shop Joe was working at when she was on the search for handlebars. This would set the tone for their adventurous relationship! They each share a passion for experiences and this spirit in them is what created their loving bond. They love through laughter, dance, and of course Jaimie's cooking. Where there is skiing, hiking, biking, or road trips, they will be there with there sweet dog (and sometimes cat). There would be no where else Joe could propose to Jaimie other than where was special to them. Towards the end of their excursion in Moab, after mountain biking and skiing of course, Joe got down on one knee and asked that their adventures together last forever. 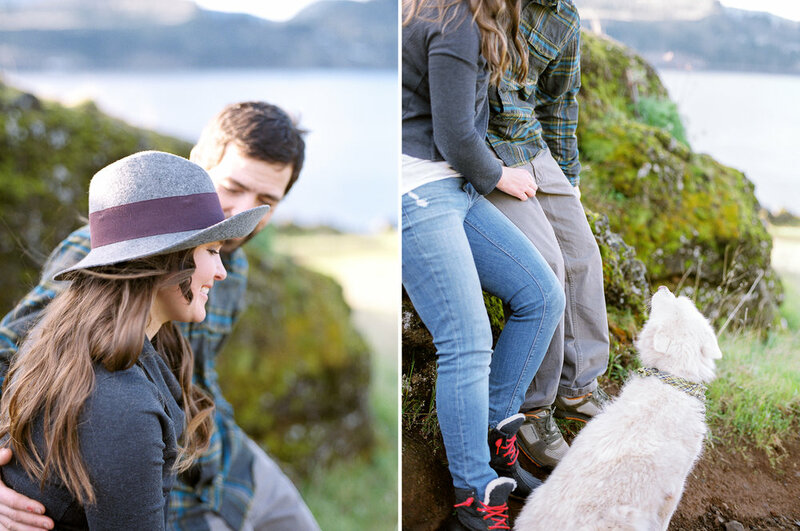 Of course she said yes, and following their session with me on the gorge, they packed their bags and scheduled out a road trip with no official end date in mind. I admire their love for not only each other, but the world they live in, and the experiences they create with what they are given. I can't wait to shoot their wedding this summer. There's no doubt in my mind it's going to be one of a lifetime.